It is recognized that citizens who call Marrowstone Island ‘home’ are unique in experience and diverse in background and interests. Among them, certain individuals reach beyond the ordinary, and in so doing have made a lasting or signiﬁcant difference to the greater community through their volunteerism, activism, and leadership. To acknowledge those endeavors, the Marrowstone Island Community Association, (formerly the Nordland Community Club) established a ‘Citizen of the Year’ Award" in 1973 and presented the first award to Ed Richey for his work in bringing the 911 red fire signs to the Island. no-charge ambulance service to residents of Marrowstone Island from late 1970s until the mid-1990s. Paula Lalish volunteered for the Marrowstone Island Emergency Medical Service (MEMS) as an EMT and caregiver for over 20 years. Greg was a volunteer first responder, ambulance driver and Chimacum fireman for those many years. They retired shortly after Jefferson County Fire and Rescue assumed the ambulance service. Paula is also a musician and poet who continues performing all over Jefferson County. They both have volunteered to help families with loved ones in Hospice. Daughter Signe Rose Lalish said “I know their volunteer contributions saved lives. I remember hearing the beeper go off late at night and one of them getting dressed and leaving. Then the next morning, I remember them telling us a little about the call, if there was anything allowed to tell.” There were so many such mornings. Now Greg and Paula are grandparents, but still serving their community with kindness, grace, and creativity. Greg continues to mentor younger builders sharing his skills teaching hands-on activities such as Cob building construction. Paula spent years, transporting her large musical harp around the area to support Hospice, providing private and community concerts to comfort the dying and their families. “Paula came into our home to play for my mother and I watched Mom’s face soften with inner peace in a way so obvious that it brought me and Paula to tears” relayed Rita Kepner, Marrowstone resident. Marrowstone Island Citizens of the Year are selected by prior citizens of the year who review nominations submitted by a current island residents. The criteria are that the selectee(s) must have made important/significant volunteer contributions to life on Marrowstone Island and/or Jefferson County. The purpose of the award is to recognize that citizens who call Marrowstone Island ‘home’ are unique in experience and diverse in background and interests. Among them, certain individuals reach beyond the ordinary, and in so doing have made a lasting or signiﬁcant difference to the greater community through their volunteerism, activism, and leadership. Paula and Greg Lalish are exemplars of “beyond the ordinary”. Our ‘Citizen’ of the year for 2015 and his family have been residents of the Island for nearly 20 years. He has worked both professionally and personally to improve our island community. He has been both Vice President and President of the Marrowstone Island Community Association (MICA). While president, he helped develop the ‘Hello Pages’, a booklet created to inform residents and newcomers of the businesses and services that are offered on this island. Our ‘Citizen’ has had a clear vision of the historical importance of Fort Flagler State Park, and spent countless hours developing strategies and completing projects for care of the Park. His passion and dedication helped lead the way to the creation of the ‘Friends of Fort Flagler’ which was established as the first ‘Friends of Parks’ in the state. That group has since become a dedicated and invaluable group in restoring, maintaining, protecting and enhancing the park. As a result of their work on the historical hospital building, in 2012, the Park was presented with the Mary P. Johnson Award from the Jefferson County Historical Society. Under his guidance, the work done there as well as in the entire Park, has increased usage and enjoyment of the area by both visitors and Island residents. Largely because of his leadership as Head Ranger, Fort Flagler has become one of the top-performing and most desirable destination parks in the Washington State Parks system. For proof of this, just try to make a summer reservation at the park – you will find that reservations must be made a LONG way in advance! All of this work has resulted in a lasting benefit to Fort Flagler, the State Park system, island residents, the county, and in fact, the entire state. So, as you all know by now, I am pleased to announce that Mike Zimmerman is the Island’s 2015 Citizen of the Year. Ray and Carolyn Lowrie are the Marrowstone Island Citizens of the year for 2014. They are long-term residents of Marrowstone Island and have done volunteer work ‘behind the scenes’ on numerous community projects, and are especially associated with the Chimacum schools. She also became known as the ‘face of Chimacum’, when she was the Chimacum Elementary School Secretary. She went far beyond her job description, soothing panicked teachers, drying children’s tears, and just ‘being there’ for so many people needing assistance of any sort. She has been a volunteer worker at the Church of the Redeemer for 30 years; working in all of the various jobs that needed doing. In addition, to raising four children, Carolyn supported her husband in his military life and then his many volunteer projects in the area. Ray was a Biology teacher at Chimacum high school, from 1960 to 1992, and had a strong sense of environmental care. He taught his students to respect the water and conserve fishing resources. He worked to get a grant to build a ‘hatchery’ on Chimacum Creek, where the students actually raised salmon. As a result of this training, some of his students were able to work at the Quilcene Hatchery to earn money during school vacations. He also set up a project where some of his students learned how to build a boat, and learn navigation. By going that ‘extra step’, he was a mentor to many kids, teaching them about ‘real world’ projects and instilling in them a life-long love and respect for nature and the environment. He was a Port Commissioner from 1986 to 1992, and was a Board member of the North Olympic Salmon Coalition from 1993 to 2003. He was also a volunteer fire fighter for the Marrowstone Fire department from 1976 to 1988. Last October, (2014) Ray was given the Eleanor Stopps Environmental Leadership award. At the presentation, it was said that his contribution to environmental stewardship was extraordinary. He knew if kids understood nature, they would protect it. Upon receiving the award, he said he encourages everyone to remember the benefits of teaching young people about the natural world and transforming them into stewards. His students have become his ‘living legacy’. Therefore, the Marrowstone Island Citizen of the Year committee members are pleased to announce that Carolyn and Ray Lowrie have earned the 2014 Marrowstone Citizen of the Year. Carl Johnson is this year’s Marrowstone Island Citizen of the Year 2013. He has been a Marrowstone resident for all of his 92 years except for his period of enlistment in the U.S. Navy. As a youth he worked for his family at the Nordland Trading Company Store as well as digging clams and delivering seafood to Port Townsend and to Seattle. From Seattle he’d pick up building materials for local residents so they could build their homes. He went to Fort Flagler to work, picking up workers who came across the Portage Canal via “THE NORDLAND” ferry, to work on building the barracks and other buildings, then later on Indian Island hauling concrete to build the batteries. This led to the Carl H. Johnson Trucking and Sons. This pick up in Seattle and delivery to Marrowstone, continued for many years with many families benefiting. Often when items (like a water heater) couldn't be delivered to persons for lack of a business number or when someone needed large items brought to the island, he personally picked up in Seattle and delivered these materials to the island. Back in the 40’s, clams were marketed both locally and to San Francisco’s Fisherman’s Wharf by his business, Marrowstone Island Clams and Oysters. He and another resident, Dr. Mumby, split an order of oyster seed brought from Raymond, WA., which was spread in Mystery Bay and Kilisut Harbor, benefiting all who enjoy the local oysters to this day. Many families who were out of work would come over to get work digging clams, picking oysters, washing and shipping seafood or truck driving. After the war, rather than storing the building products on Marrowstone Island, he bought the property at Nesses Corner in Chimacum and established Carl’s Building Supply. Since then his 3 sons, Leonard, Lawrence and Jake followed in their dad’s footsteps. There were always jobs for young people as well and these got their superior work ethic from this individual. At a lumber yard in Seattle, many of the young people worked in the late 70’s and early 80’s, including Carl’s daughter Lisa. She was told by the owners that the best workers they’d ever had were kids raised on Marrowstone—and it was because they all grew up working for Carl Johnson. He has been generous whenever any local non-profit organization has asked for help. Donations of seafood products for cookouts or barbecues are well known. There have been tours of his businesses given for the Historical Society. One year when Marrowstone had 17” of snow, a family got up thinking they were snowed in and were delighted to find their driveway totally plowed by Carl. Many nice things are done without being asked, just to be a good neighbor. Only someone who has lived locally with equal longevity can truly appreciate the effects of this individual’s life over the last nine decades. This year’s Marrowstone Island Citizen of the Year is a colorful icon, family patriarch and businessman extraordinaire, CARL JOHNSON. Carl passed away 12/4/2017. Click here to view an article about him. Bob and Sandy Barrett were selected as Citizens of the Year 2012 for Marrowstone Island at the January 22, 2013 MICA meeting. Bob’s efforts include 12 years as an aid car driver for East Jefferson Fire Rescue. He also has served as a board member and president of the Marrowstone Island Foundation, a philanthropic organization which manages funds designated for projects to benefit Islanders. He has worked as a docent at the Museum of Flight in Seattle, where he has given private tours to Marrowstone Island residents. He has assisted with numerous Nordland Garden Club activities, including help with set up for the plant sales, and providing his ‘famous onion soup’ for the ladies working to make wreaths for the club’s annual sale. He also made new nametags for members of the Island Community Association. Sandy has been an active member of the Garden Club, serving terms as Vice President, Secretary, Trustee, and is the club Historian. This job entails taking photos at each meeting and special events and creating scrapbooks to record members and their participation in various activities of the club. She has provided the club with 12 years (and counting) of scrapbooks documenting the history and members of the club. (they are on the top shelf of the bookcase). Sandy, has also worked with the Literacy Council of Jefferson County, serving as treasurer, a tutor and as the one of the initiators of the group’s Baskets of Books project, in which children’s books are provided in places such as restaurants and doctors’ offices. She was also one of the organizers of the recognition dinner for current and former firefighters, EMT’s, and aid car drivers for East Jefferson Fire Rescue. The Barretts have taken American Red Cross training in shelter management, and Sandy has created and maintains an Excel spreadsheet of Red Cross emergency shelter locations in Jefferson County. She is a member of the Red Cross ‘canteen team’which provides food for emergency responders to incidents of long duration. Bob had a 24 year career as a Naval Flight Officer, retiring in 1984 as Captain. During this time, they lived in 15 different places, including a two-year tour in Japan. Upon retirement from the Navy, they moved to Spokane, where Bob owned a computer store and Sandy worked as a computer programmer and analyst for Spokane County. When Bob sold the store and Sandy retired, they searched for several months for a place to live where they could see the water. They feel extremely fortunate have found this Island and it’s marvelous community of friends. Others first met Ray and Mary when they taught disaster preparedness classes, called citizen emergency response training (CERT). Ray and Mary upgraded their training skills to lead “Train the Trainer” classes subsequently passing along their caring and skills on Marrowstone Island and much of E. Jefferson County. They were among the group who volunteered time and abilities to help reconstruct the Marrowstone East Beach Park Pavilion. Ray used his construction skills while Mary helped feed volunteers. The pavilion is in a public park and open for everyone to use. Earlier, they were organizers of Conserve Water First. The educational effort, helped many people understand the island aquifer limits. Ray and Mary continue to urge respect for water as a critical resource. Ray served on the Kurtso advisory committee and he spent uncounted hours researching options for best use of the funds available to the island. Eventually, the committee accepted construction of the Kurtso Memorial Pavilion at the Nordland Garden Club. In past years, Mary was an active member of the Nordland Garden Club and Ray assisted in various projects including the renovation and remodeling of the Nordland Garden Club building and complete reconstruction of the bathrooms. Mary coauthored the Marrowstone Island “Hellow Pages” a welcome pamphlet full of information for old-timers and new residents of the island. She also helped scan images for the new Rural version of the Map Your Neighborhood (MYN), an emergency preparedness handout. Currently, both are involved in healthy food gardening using on-island resources. They are working with other islanders to learn about permaculture and organic techniques. Mary and Ray are encouraging the exchange of information about growing food sustainably, with other island gardeners and small farmers. of MICA (Marrowstone Island Community Association) with 35+ members attending.. Phil Flynn, Citizen of the Year 2008, as chairman of this year’s selection committee made the announcement and presented the plaque with his name. Choice is made by a committee of past citizens of the year and MICA board representatives. Before retiring to the island Pete was an Advisory Programmer for IBM in many parts of the U.S., latest in San Jose, CA; prior in San Mateo, CA; Austin, Texas; Boca Raton, Florida and New York---all in 6 years. (You know IBM stands for “I’ve Been Moved”). Pete has one daughter and two grandchildren living on Cape Cod; a stepmother in Florida and three brothers in Florida, Phoenix and North Carolina. Because of the major distance away Pete said they probably won’t be attending the dinner in his honor scheduled tentatively for march/April, the exact date give later. Pete was selected for his several volunteer activities on Marrowstone (All candidates must have performed volunteer activities that have widespread and long lasting effects on Marrowstone, Island and/or Jefferson County) He has worked many hours with Owen Mulkey of the Department of Emergency Management, trying to prepare us on the island for taking care of ourselves in any disaster. Especially in regards to getting information to the community. public information sites like the fire department, county government, Friends of Fort Flagler---and how to get information on and/or join the organization. He has been two years president of MICA and is currently on the Nominating Committee. He was involved with the “Hellow Pages” which are listings of all the organizations on the island—and created a digital version of this booklet. He was instrumental last year in organizing and setting up the celebration potluck dinner (attended by some 150 residents at Fort Flagler) for all of the EMT’s, first responders, drivers and fire fighters who have served Jefferson County Fire District #1. One unique part of this dinner and program was a memory timeline where all could add memories all the way from the early days in MEMS (Marrowstone Emergency Medical Services) to the latest retirement of the last EMT’s on the island. 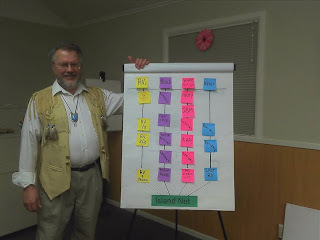 Probably the most important and long lasting volunteer effort he has contributed to our island community is the setting up of our “Island Net”: the Marrowstone web site, egroups communication via the internet for presently 234 households. Information comes thru this about boats that have lost their moorings, lost dogs and cats, cougar and bear sightings, meeting announcements, activities of many kinds all over the island. It is a connection we enjoy that nobody else has; a way of bringing us together as an island community. Citizens of the Year have been selected on Marrowstone every year since 1973 when Ed Richey was the first one chosen. Links: What I have done since the award. PDN article - All Island Net posts about this event YouTube slide show PTL article Click on any photo to see the rest of the album. Carl W. Swanson appointed to fill a vacant Jefferson County Hospital Commissioner position in 1979. He subsequently was elected to 3 six-year terms. He organized and chaired the citizens' advisory committee for budget and finance. He chaired a series of community and county long-range planning citizens advisory committees. This planning process resulted in the construction of the new hospital addition in 1996. For this service and numerous others, Carl was honored by receiving the Citizens of the Year award from MICA. Sept. - Nov. MICA President appoints up to 2 MICA members to be added to the COTY selection meeting. A nomination is made by ﬁlling out a Nomination form (see The Nomination Form below) listing, to the best of one’s knowledge and ability, the reasons that individual should be selected, and signing it. 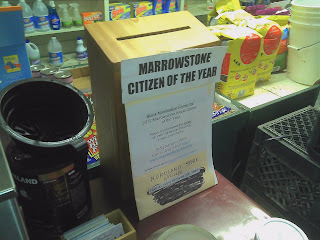 Either 1) place the NFs in the secure Nomination Box at the Nordland store, or 2) mail it to the address listed in the NF.The nominee(s) must be a Marrowstone resident who has performed a significant volunteer contribution to life on Marrowstone Island and/or Jefferson County. Please list the achievements that make the person you are nominating eligible for the honor. Nominations may only be made by an Island resident, and only Island resident(s) may receive the award. During the first week in January, a meeting is held by the Marrowstone Island Citizen of the Year Committee comprised of previous Citizen of the Year recipients together with two (2) voting MICA board members. At that meeting, the Nomination Box is opened, the validity of each nominee is ascertained, and a selection is made. The candidate selected remains a secret until announced at the January MICA meeting.A celebration dinner occurs within the next few months at the pleasure of the honoree and honorees are invited to ride in the Rhody Parade in May. Click here to view the complete "Citizen of the Year (COTY) Guidelines". The picture to the right shows the the setup and location of the Nomination Box at the back of the Nordland store. Blank Nomination forms are in the folder in front of the box. Nomination Forms are available in front of the Nomination Box near the stove in the back of the Nordland Store.